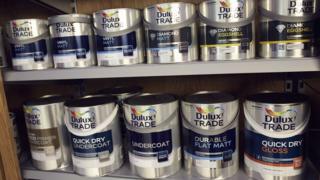 An activist investor in Akzo Nobel is making a legal bid to force the removal of the Dulux paint owner’s chairman. Elliott Advisors says Antony Burgmans should be ousted because of the Dutch firm’s refusal to enter takeover talks with US rival PPG Industries. In a petition filed with the Dutch Enterprise Chamber, Elliott said Mr Burgmans had not discharged his duties. Akzo has rejected three offers from PPG, but some shareholders – including Elliott – back the bid. Mr Burgmans and chief executive Ton Buechner say the bid undervalues Akzo. The most recent offer, rejected on Monday, is worth 26.9bn euros (£22.7bn). Elliott, which holds a 3.25% stake in Akzo, had teamed up with other like-minded investors to request an extraordinary meeting to vote on a proposal to remove Mr Burgmans. However, the company responded by reporting Elliott and PPG to Dutch regulators for possibly sharing potentially “sensitive” information with PPG regarding support for the meeting. Now Elliott is seeking to “enforce the rights” of shareholders to hold the meeting. “Elliott views Akzo Nobel’s rejection of PPG’s third proposal without entering into any constructive form of engagement with PPG as a flagrant breach of Akzo Nobel’s boards’ fiduciary duties and of Dutch corporate law, and as an arrogant dismissal of recognised principles of proper corporate governance,” it said. Akzo has said that the removal of Mr Burgmans would be “irresponsible, disproportionate, damaging and not in the best interest of the company, its shareholders and other stakeholders”. Elliott, which became an Akzo shareholder in December, is known for its aggressive moves. Founded in 1977 by American activist investor Paul Singer, it made a name investing in national debt in countries such as Peru. The firm is most famous for its long legal battle over Argentine debt, which climaxed when the firm seized an Argentine naval ship docked in Ghana. The hedge fund is also pushing mining giant BHP Billiton to reorganise and spin off its US oil unit. Mr Buchner has proposed selling Akzo’s chemicals division and has embarked on a series of share repurchases.